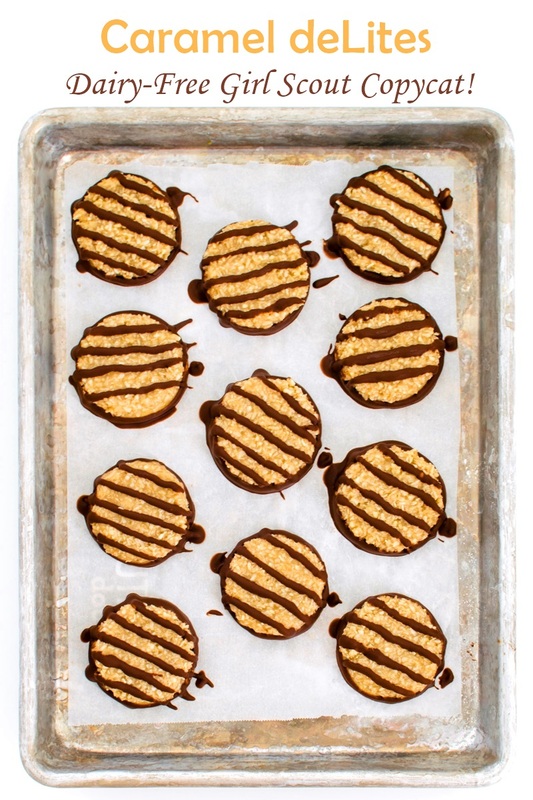 Today, I’m updating an all-time favorite recipe for vegan Samoa Girl Scout Cookies, now known as Caramel deLites. A version of this recipe is also in the 2nd Edition of my flagship book, Go Dairy Free: The Guide and Cookbook. And I’ve taken some new pictures to entice you! You originally asked for this recipe on Facebook, and I delivered. Truth be told, I was really hoping there would be more votes for the Tagalongs or Peanut Butter Patties. 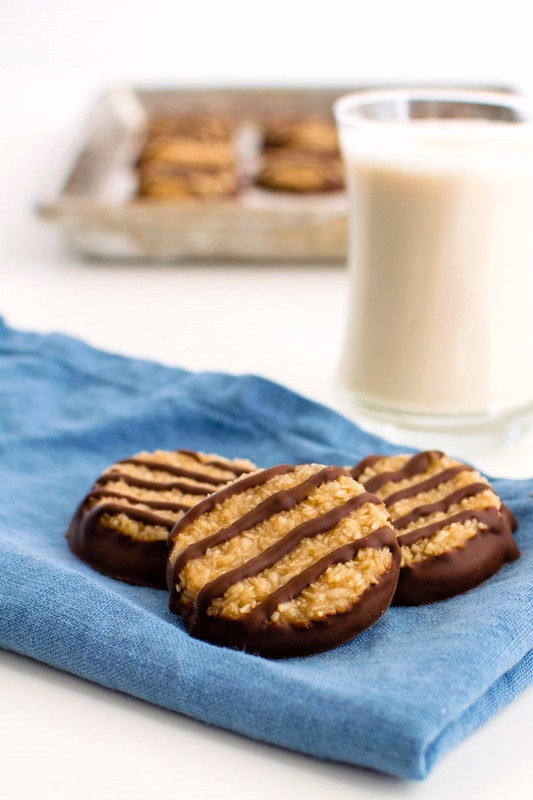 But when I posted my Dairy-Free Thin Mint recipe, and asked what other Girl Scout cookies you would like to see a recipe for, the response for a Samoa girl scout cookie recipe was overwhelming. So do they taste like authentic Samoa cookies? Um, well, I couldn’t tell you … I’ve never actually had a Girl Scout Caramel deLite cookie. But, I can tell you that they taste really darn good. It’s the perfect dessert to enjoy for holidays, or when cookie cravings strike. Which is pretty much every day. 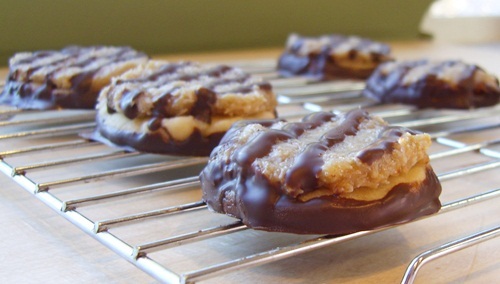 Since I’d never tried Samoas, I needed a girl scout cookie recipe model to work from. However, I was surprised how few recipes I found for this cookie, and how so many of them weren’t true to form. I found bar versions that didn’t even have a chocolate base (how could I deny you of an extra chocolate layer? ), I found recipes that were void of the shortbread base (true, I would have been happy without the shortbread, but I know how you all love it), and in Vegan Cookies, she skips the caramel topping altogether (a bit sacrilegious don’t you think?). I did my best to stay loyal to the original cookie, but of course had to change up the recipe a bit to make it dairy-free, egg-free, and vegan. Okay, okay, I skipped the hole in the middle too. I mean, that’s a little nit-picky don’t you think? And you get more per cookie with my simple round version. If you must, use a wide straw or some other small circular instrument and painstakingly remove a hole from the center of the fragile shortbread dough. But when you start cursing like a sailor, don’t say I didn’t offer an easier solution! I originally shared this recipe on my old blog, and brought it over here. Here is some feedback from readers who tried the recipe, but left a comment on that original post. What a great one Alisa! Once you get a sort of assembly line going they don’t take too long to make. I think next time I will double or triple the recipe and make a bunch, people eat them like crazy. I also tried rolling the dough slightly thinner and cutting a wider cookie with the hole cut out of the center and they looked like perfect copies, but putting the coconut topping on becomes a huge task when you do this, not really worth it in my opinion. ~ Joe K.
Thank you SO much for sharing this recipe! 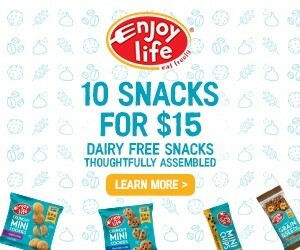 I am addicted to baked goods, but cannot eat dairy, eggs, or nuts because of my son’s allergies. 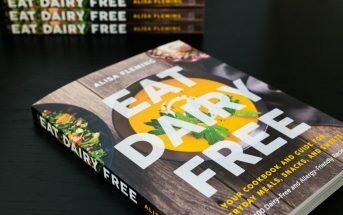 By ingredients, this recipe is dairy-free / non-dairy, egg-free, nut-free, peanut-free, optionally soy-free, vegan, and vegetarian. For gluten-free and vegan “caramel delites,” you can substitute your favorite gluten-free flour blend for the all-purpose flour. 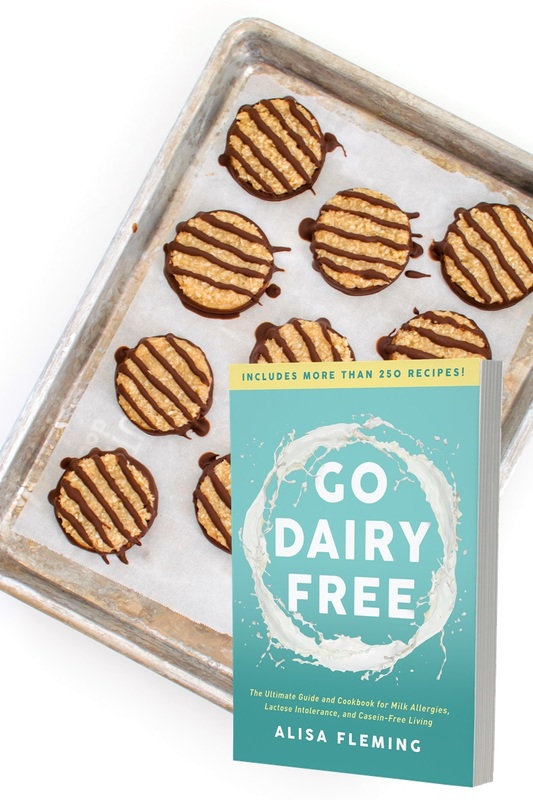 This recipe is a slightly adapted version (for online) from the Caramel Delight Girl Scout Cookies Recipe in the 2nd Edition of Go Dairy Free: The Guide and Cookbook. Preheat your oven to 350ºF and line baking sheets with parchment paper. Put the buttery spread, sugar, milk beverage, and vanilla in a medium mixing bowl. Beat with a hand mixer until creamy. Add the 1 cup flour, baking powder, and salt to the wet ingredients and beat until well combined. Stir in up to ¼ cup of additional flour (up to ½ cup above 4,000 feet) to keep the dough from sticking to your hands. Bake for 10 to 12 minutes (up to 16 minutes above 4,000 feet), or until the cookies just begin to brown around the edges. 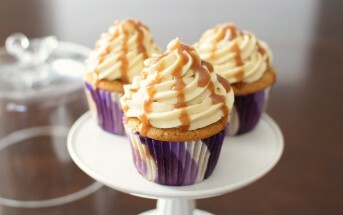 Let cool on the baking sheets while you prepare the caramel topping. Combine the coconut milk, brown sugar, and salt in a small saucepan and bring to a simmer or low boil. Reduce the heat to medium-low, cover, and let simmer for 10 minutes. Keep an eye to be sure it doesn’t threaten to boil over. Uncover and continue to let the dairy-free caramel simmer for 20 to 25 minutes, stirring occasionally. It should become somewhat thick, like a caramel sauce. But keep in mind, it will thicken more as it cools and when you add all of that coconut! Remove the caramel mixture from the heat, and stir in the vanilla, followed by the coconut. I used all of the coconut, which made it very thick, and almost dough-like to handle. Top each shortbread cookie with the caramel-coconut mixture. I use it all up, making a fairly thick layer of topping. My topping was thick, so I wet my hands (to prevent sticking) and pressed it down to evenly cover the tops of the shortbread. Melt the chocolate chips with the coconut oil, buttery spread, or shortening. Dip the shortbread bases in the chocolate. You can either coat just the bottoms, or submerge up to the caramel layer. I make them both ways. Place the cookies chocolate side down on parchment paper or a silicone baking mat to firm up. Drizzle the top of the cookies (over the caramel layer) with any leftover chocolate. I’ve read that you can drizzle with a fork, but that doesn't work well for me. For the pretties results, you can pipe the chocolate. Let the cookies sit in a cool area so that the chocolate can set up. Usually this will happen at room temperature. But if your heater is set on “melt chocolate” (over 70 degrees), or you're antsy, you can place the cookies in the refrigerator for about 30 minutes. Store the cookies in an airtight container at room temperature for up to 1 week, or put them in plastic freezer bags and freeze to enjoy later. 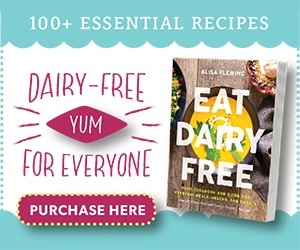 For More of My Recipes, Get Go Dairy Free! I have NEVER had a vegan girl guide cookie! We don’t get the same cookie options in Canada, and I always wanted to try some of these vegan cookies. I guess now I kind of can. 🙂 These look soooo yummy, Alisa. So excited to try this gluten free! I never feel bad about missing out on girl scout cookies with the exception of Samoa’s! They are my absolute favorite and I can not wait to try these out! THANK YOU! OMG !!! These cookies are soooo freaking good !!! I’m dairy/soy free so to find this recipe was a dream as these are one my favorite girl scout cookies !!! 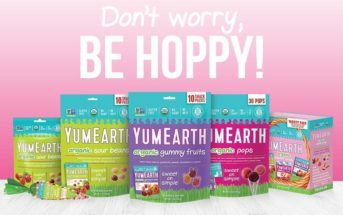 I mad them last night, and just cant stop eating them lol they are better the longer they sit…and I did have one with my morning coffee and mmmmmmmm’d all the way through it !!! Thank you so much for sharing this recipe 😉 Love it !!! Wonderful! I’m so happy you loved the recipe Shari. These are favorite cookies in our house too! Can you substitute white sugar/molasses for the brown sugar? You should be able to use white sugar for the brown. Pingback: Vegan Girl Scout cookies are here! I had a can of full fat coconut milk and was looking for a cookie recipe. First of all, these are my favorite Girl Scout cookies ever! My son is casein intolerant so we live dairy free. I loved loved loved these cookies. I didn’t have enough coconut flakes but used what I had and they turned out great! You were right about watching the milk/brown sugar/salt. I step away for a second and it boiled over. 🙂 other than that everything was just as you said. Thank you for all the wonderful recipes. You don’t even know what a blessing they are to kids and those of us dairy free. Thanks for this recipe. Just tried it with Bobs gluten free flour in place of wheat flour and it worked fine. However it is very delicate and you have to bake a few extra min! I have been craving samoa’s watching my husband and son eat our nine boxes of Girl Scout cookies. I have a milk allergy and can’t have gluten or wheat. I made these tonight and after the first bite was not disappointed. These were probably the best treat I have had since being diagnosed with my allergies. Thank you sooooo much for this amazing recipe! These did not turn out for me. My caramel didn’t thicken much. Are you supposed to let it cool completely before putting onto the shortbread? The measurements seemed off for me as well. I feel like I have a ton of the caramel mixture and not enough cookie base. Hi Sara, it sounds like one or two things happened: the caramel mixture was not cooked long enough (it still needs to reduce down, and times may vary by humidity, stoves, etc.) 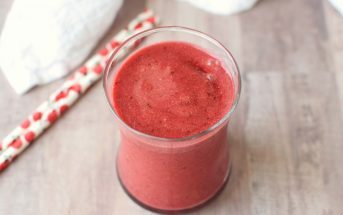 and/or full fat canned coconut milk wasn’t used (this recipe will not work with light canned coconut milk or coconut milk beverage – it must be canned, full fat coconut milk). I do let it cool prior to topping the shortbread, but if you had way too much of it, then I’m thinking the other two things that I noted are more of the issue. Use full fat, and cook it down until it is thick and caramel-like. Once you had the coconut and let it cool, it is VERY thick. Hey there, just wanted to let ya know that this recipe worked really well for me. I was taking part in a cookie trade thru my husbands work at Christmas and they have a co worker there that is hypersensitive to a lot of stuff so I ended up finding this recipe and making a triple batch. Well they were the biggest hit in the place. I even now have requests for more of these little wonders so thank you so much for this wonderful recipe I will be making these for years to com I’m sure.